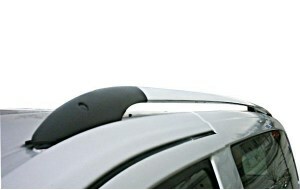 For vehicles with Awning rails fitted. All our driveaway-awnings incorporate a conventional Awning cord in the roof of the tunnel that attached to the vehicle. For vehicles with awning rails fitted it can be a simple case to attaching the awning using the awning cord, as you would a caravan awning, but we do not recommend this. As driveaway-awnings differ from caravan awnings. Caravan Awnings are designed to be connected to the caravan and then erected, remember you never driveaway from them, unlike driveaway-awnings. A driveaway-Awning is designed to be erected as a freestanding awning, then attached to the vehicle. giving you the ability to DRIVEAWAY. 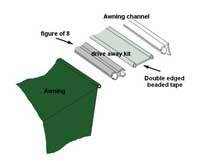 To fully utilise the driveaway-awning use a driveaway Kit. This consists of some lengths of Figure of 8 profile and a Length of Double edged beaded tape or KADOR as in the diagram. Simply erect your driveaway-awning, attach the figure of 8 profile to the awning cord on the driveaway-awning. Hold this up to the awning channel on your vehicle and slide the KADOR into the free side of Fig 8 and the Awning Channel. The awning cord is feed into one side of the fig. 8 strip. the other side of the fig. 8 strip is slotted onto the vehicle gutter rail. Unfortunately lots of modern vehicles do not have gutter rails. (Mazda Bongos owners can smile at this point). 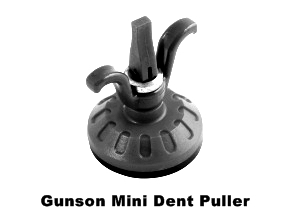 For vehicles with shallow Guttter Rails (Early VW's) or roofrails or as an alternative on vehicles with gutters. 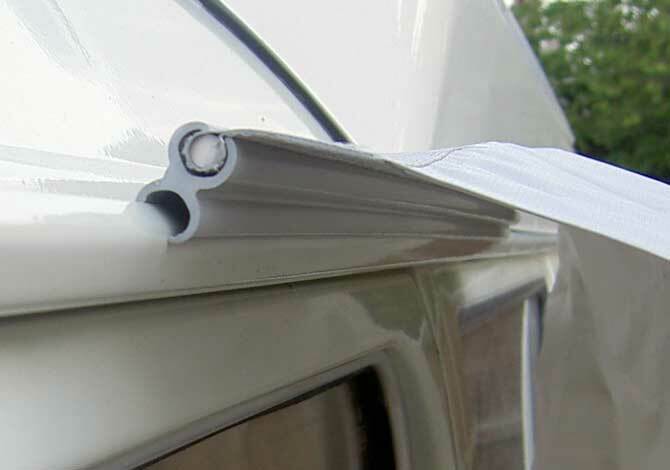 Some Vehicles like early VW Vans, have a shallow gutter, a better fixing option for these is a Pole & Clamp Kit. The majority of awnings have a pole sleeve incorporated into the tunnel of the awning. 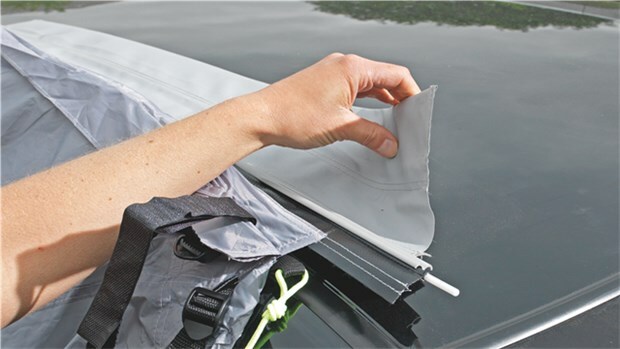 A pole fed is fed through the pole sleeve, this can then be placed in the gutter and fixed to the vehicle using clamps, you can also use this method on vehicles with parallel roofbars using straps to hold the bar to the roof rails. If you vehicle has a wind out awning. Then you can utilise the awning channel built into this to attach a driveaway-awning. You will need some lengths of Figure 8 and a few metres of KADOR. 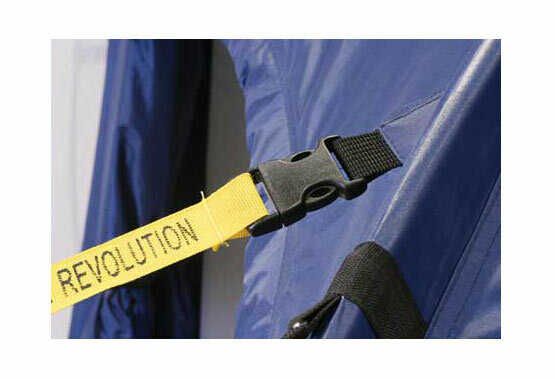 Locate the awning channel on your windout awning. 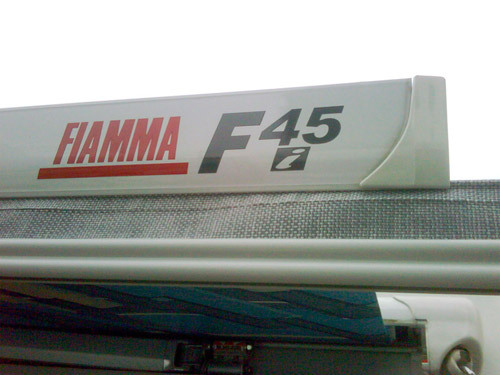 On most Fiamma Awnings this is simple as you can see in the pictures above. 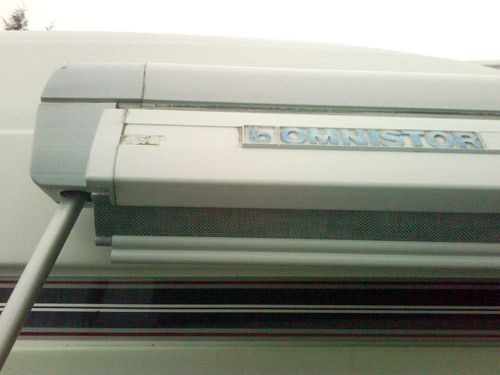 (For 2011 Fiamma Awnings will have 2 of these awning channels). On other awnings this awning channel maybe less obvious and mounted behind the from rail (as Picture 3 above of an older Omnistor awning). YOU SHOULD NOTE THAT YOU REQUIRE A SPECIAL KADOR AS THE AWNING CHANNEL ON A WIND OUT AWNING IS GENERALLY ONLY 4MM IN DIAMETER. Simply attach your driveaway-awning to your wind out awning, and roll your wind out awning back in. With this arrangement, some awnings from Vango & Outwell have velcro tabs on the tunnel that can be wrapped around the roof rails as a fixing. Otherwise you can use a pole through the pole sleeve and make your own velcro taps to attach the pole to the roof rails. When no other suitable fixing is available. 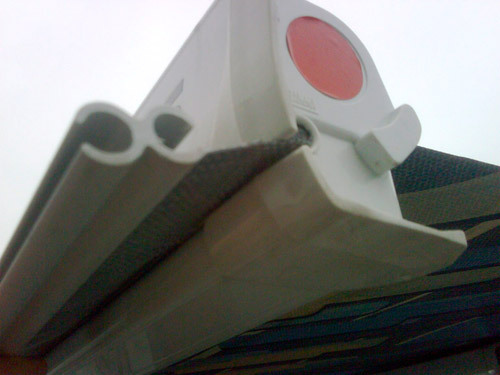 The awning can be attached using guy lines or straps. Fix the guyline or strap to the awning tunnel, Some Awnings have eyelets or in the case of some OUTDOOR REVOLUTION AWNINGS clips, that allow you to do this. Simply throw the guyline or strap over the vehicle an peg it down on the opposite side to the awning. Purpose make Suction fixings. 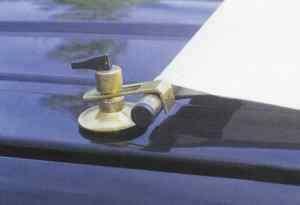 Made from Brass these are relatively expensive and being made from Metal are likely to damage your vehicles paintwork if they come adrift. 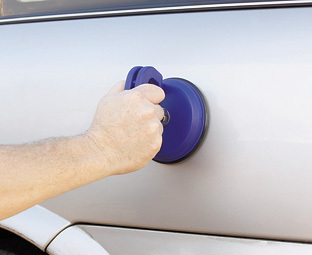 Dent Pullers work using suction to attach to the vehicle, If you have a relatively flat area on the roof of your vehicle it is possible to stick the dent pullers to a shiny surface on your vehicle and attach the awning tunnel to them using a pole or straps. You will need to be flexible and adapt to the fixing method most suited to you, your Awning & your vehicle.